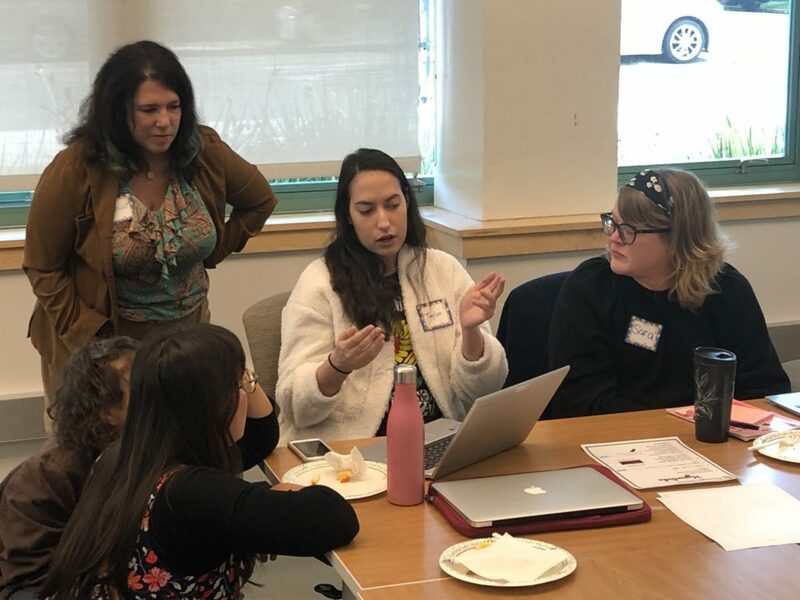 A total of 25 elementary school teachers who are new to Berkeley or new to grades 3-5 in the past couple of years convened last week for a productive and inspiring instructional technology professional development training. Teachers sharing ideas during the morning session. During each 3 hour session (½ the group attended in the morning and the other ½ participated in the afternoon), teachers were introduced to Screencastify (a Chrome extension that creates a video of one’s computer screen and their voice) and brainstormed ways it can be integrated in the curriculum to amplify student voice. Teachers also explored our Google Slides resources (introductory screencasts and tip sheets) and looked at ways students can use these tech tools together. Additionally, the group found inspiration from our collection of student tech projects from the past couple of years. Teachers spent a nice chunk of time collaborating with grade level colleagues from different school sites and they left with plans which can be implemented in the near future. For instance, Katie Campbell Lewis (4th grade at Emerson), Rebecca Goodin (5th grade at Sylvia Mendez), Janine Herbertson (3rd grade at Cragmont), and Taylor Totten (4th grade at Emerson) all created screencast tutorials for their students. 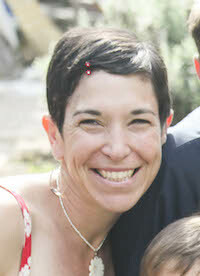 Megan Abramson-Ward (5th grade at Thousand Oaks) developed a Book Club Google Slides and Screencastify assignment. Feedback for the sessions was overwhelmingly positive. One teacher noted it was beneficial “having the opportunity to discuss integrating the tech tools with upcoming units.” Many appreciated collaborating with teachers in the same grade from different schools and the chance to learn and practice tech tools in a supportive environment. The DigiTech team will continue to foster ongoing tech integration and collaboration. As always, please reach out to us to plan and support student use of technology for learning in your classroom. The Internet is awash in false or misleading “facts” and lots of sloppy research. 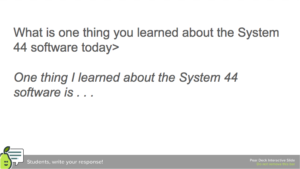 Where can students find accurate information online? How can we show students credible resources? Using databases filled with vetted articles, students can quickly and reliably find verified information on a vast range of topics. 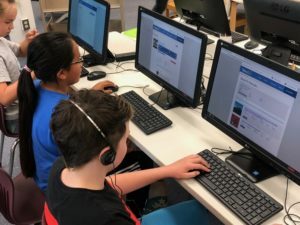 This year, the California State Library began providing all of the state’s school children and staff with access to several quality databases. The new databases include the Encyclopedia Britannica, ProQuest database suite, and TeachingBooks.net. This state-wide purchase now saves BUSD approximately $15,000 a year that was spent on access to online encyclopedias and databases. The Tech Teacher Leaders and the library staff at all the schools have been introduced to the new databases and explored some of their features. Teachers were happy to find that searches could be filtered by grade or reading level, and that students had access to advanced research tools. Keldon Clegg of Berkeley High noted, “It demystifies research and makes research paper writing feel more collegiate,” while commenting on students’ enthusiasm for the new databases. For elementary students, the Encyclopedia Britannica is a great place to begin gathering information. In addition to the thoroughly researched and annotated articles, written with grade-level appropriate language, topics are highly illustrated and often include videos. Included in the state-funded bundle is the Spanish-language Britannica Escolar. CultureGrams has information about cultures and communities around the world, including kid-friendly recipes from every country and state. In the middle schools, teachers have used the ProQuest databases to find articles for students to read and annotate. Students have used Encyclopedia Britannica for research units on such topics as the Middle Ages and Islam. Librarians check Teaching Books for background information on the authors and titles for the Battle of the Books team reading competition. At Berkeley High School, students have used the ProQuest database to access articles for numerous academic tasks such as writing annotated bibliographies for AP Environmental Science. For advanced language students, they will be able to find scholarly articles in languages other than English. Teachers can rest assured that their students are finding relevant materials and can move on to the important task of interpreting the information. Students using Chromebooks in Mallorie Baron’s classroom. 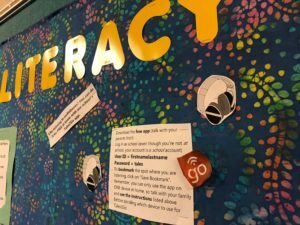 Students and teachers are starting to take advantage of a tech tool called Adobe Spark which transforms photo slideshows into videos. Recently students in Mallorie Baron’s Beginning Spanish classes at King Middle School applied their knowledge of vocabulary words related to family by creating “Mi Familia” videos using Adobe Spark. 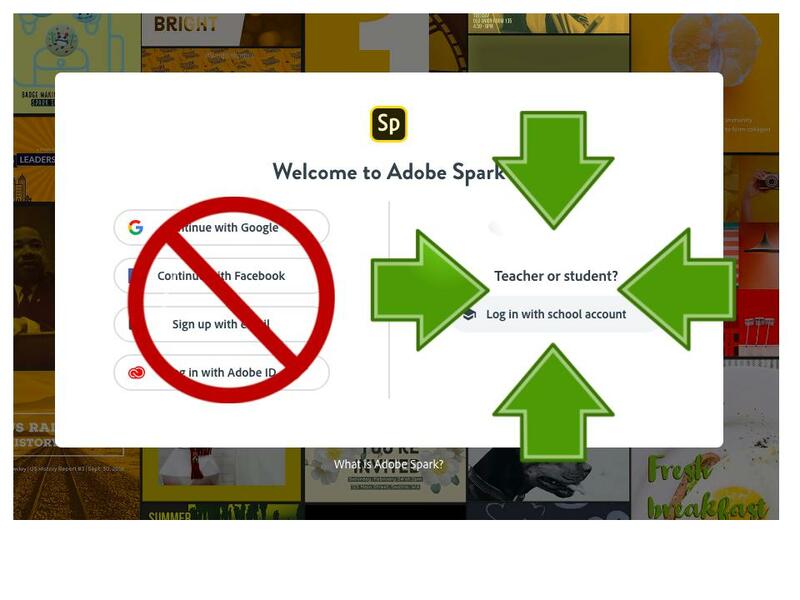 Note: Berkeley students should log into Adobe Spark with school account. See our linked logging in guide for a complete list of steps. First students collected photos of their family members. Then they logged into Adobe Spark using our school account, and started a video from scratch. On each blank slide, students uploaded a family photo, wrote a caption for it, and then recorded themselves describing the family member in Spanish. Students could then listen to the audio they recorded for that slide and decide whether or not they wanted to re-record over it. Also, students chose from the library of background music available on the site to complete their polished project. Once finished, students shared a link to their project in Google Classroom so that videos could be shown to the rest of the class. This was a fantastic way to practice speaking and listening and develop students’ language skills. These videos are a heartwarming look at each student’s family as well as a snapshot of their developing language skills. Special thanks to a number of students and their families for graciously agreeing to share their videos in this blog so you can see a sampling of these awesome projects for yourself! Please click on the links below to check out these family videos. What a lovely way to bring students’ lives and voices into the classroom! Students in Berkeley and beyond were abuzz as they coded on computers during Hour of Code. 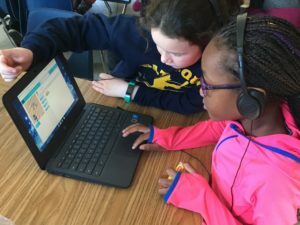 Hour of Code is an activity that introduces students to computer science in just one hour. This annual event occurs each December to celebrate Computer Science Education Week. Started in 2013, now millions of students participate worldwide tackling dozens of engaging activities on the Hour of Code website. Third graders coded cool dance moves, traversed through the Minecraft aquatic world, and programmed Star Wars droids in a galaxy far, far away. By day three, students had a lot to say about what coding is all about and were confidently completing coding challenges well within the hour! 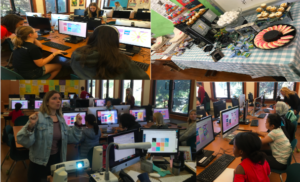 On both Tuesday (for Hour of Code) and Thursday (for the Girls Who Code club launch), 40 students filled the room using all of the desktop computers plus Chromebooks from a nearby classroom. Girls who attended on Thursday created 3D drawings of their superpower using an app called Quiver. In addition to fun computer science activities, students won prizes and devoured snacks. Keep in mind Hour of Code activities are designed to be self-guided and require minimal planning and no previous coding experience. There are activities that don’t involve computers. Plus Hour of Code and other coding activities can be incorporated at any time of the year. Are you ready to implement a coding lesson for the first time? Remember Tech Teacher Leaders and members of DigiTech are happy to provide classroom support. Let’s keep coding! 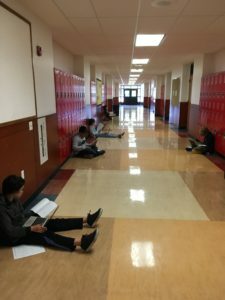 In Berkeley we’re always looking for ways to help students connect to reading and narrative in new and diverse ways. Audiobooks can be a wonderful way to help bring stories to life, to engage struggling readers, and to provide new access points to literature for all kids. 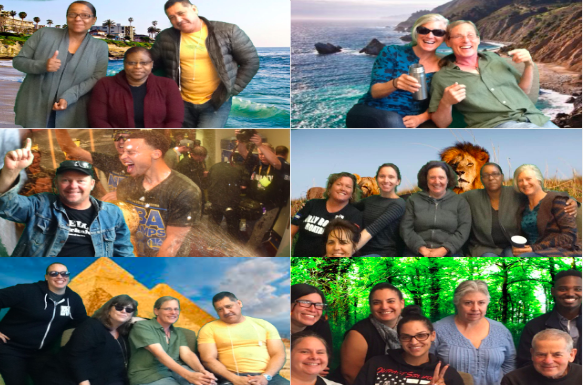 In 2014, the library services department at Berkeley Unified piloted a new audiobook subscription, Tales2Go, which offers thousands of titles at all reading levels and genres. 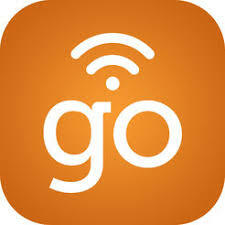 In these last four years, usage of the service has grown – Tales2Go is now the first stop for many of our students and teachers when looking for new (and free) audiobooks. 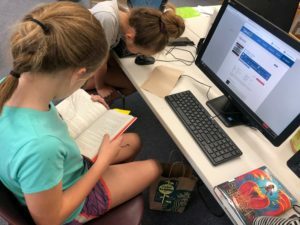 Although most of our students access Tales2Go at home – logging into their free account on a desktop computer or downloading the app – many teachers, librarians and literacy coaches in the district are also using audiobooks during the school day. This tech tool provides another way for our students to access stories, build their comprehension skills and hear complex vocabulary. 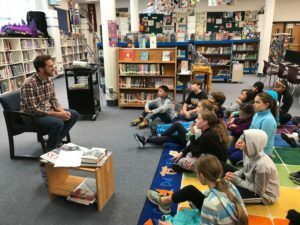 Annelisa Hedgecock, who teaches fifth grade at Washington School said audiobooks were an important tool for engaging reluctant readers and allowing these students to experience and enjoy books they could not read independently. “For many students listening to a book was the most positive literary experience of the year,” she said. For many students listening to a book was the most positive literary experience of the year. help readers process auditory information. 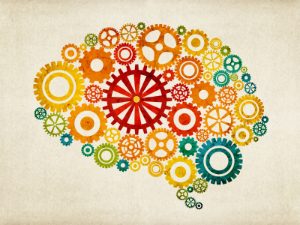 build comprehension, especially for students who struggle with decoding. give students access to books above their reading level. encourage high-level critical thinking, listening and interpretation. help motivate and interest readers, especially those that are reluctant or struggling. bring the joy of stories to all students. Pairing a print book with an audiobook is a useful strategy to help readers decode and build fluency. Several of our elementary libraries are making it easier for students to pair books by gathering print books that are also available on Tales2Go. At Emerson Elementary, Library Media Specialist Zoe Williams created Tales2Go book bins to help students find books to read while listening during recess. 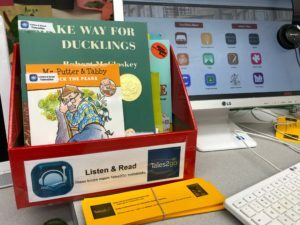 The Oxford Elementary Library Media Specialist, Karen Sasamoto, created Tales2Go labels to make it easy for her students to find titles that are also available as audiobooks. 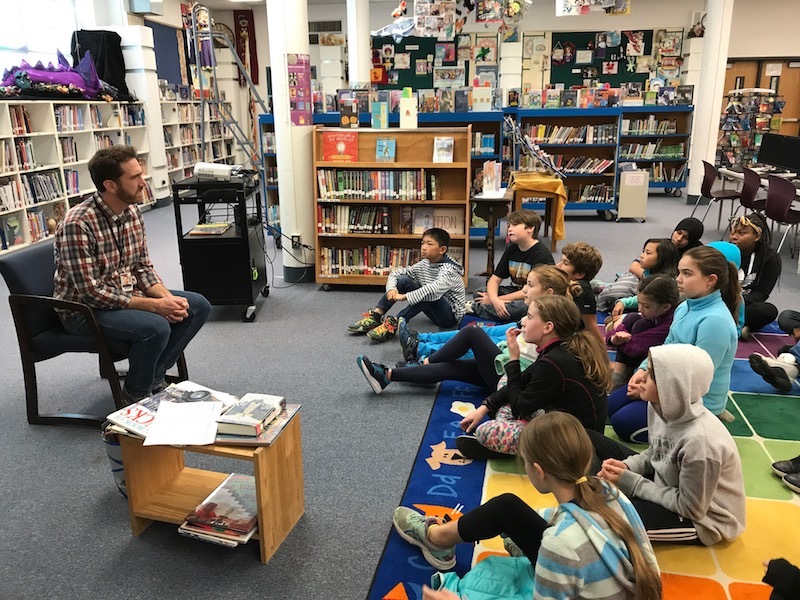 Every Berkeley elementary school is taking part in a Mock Newbery Book Club, in which students are asked to read 11 potential Newbery winners and then come together to discuss and eventually vote on the book they believe stands out based on Newbery criteria. Several of the books are available on Tales2Go, which makes it easy for students to access these popular titles if a print copy is unavailable. More importantly, using audiobooks in book clubs can help students who are struggling readers become more engaged and contribute more fully to book club discussions. We are pleased to see Tales2Go taking off in the classroom and at home. Find more information about getting started with Tales2Go on your school library website. Look for the Tales2Go logo for specifics, or ask your school librarian. Here’s a snapshot of four fun technology events that our teachers and staff were involved in this past week. Last weekend, five Berkeley teachers attended Fall CUE, the largest edtech conference in northern California, as part of a Berkeley Public Schools Fund Strategic Impact Grant. All returned to Berkeley inspired by many innovative ideas that the group will explore and share throughout the year. The Tech Teacher Leaders (TTLs) who attended shared highlights and lessons learned at the conference with the larger TTL group. Holen Robie (4th grade teacher at Emerson) showed us routines using images to spark creative and critical thinking as well as speaking and listening from a presentation called “Empowering ELLs in the Google Age” (by Abby Almerido, Santa Clara County Office of Education). 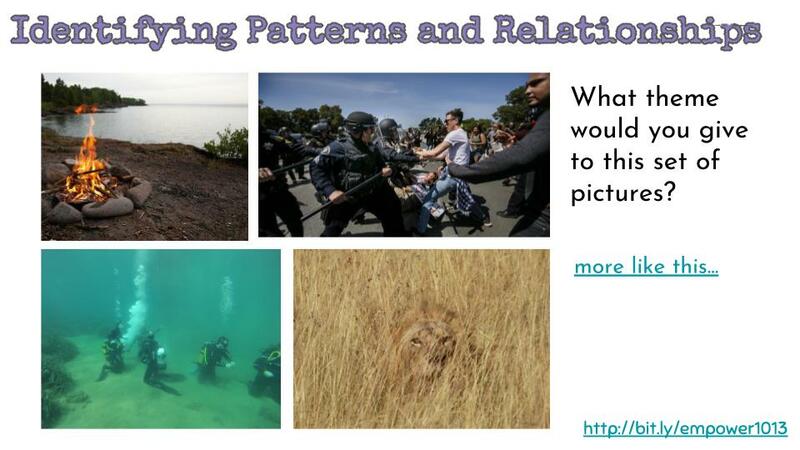 In one example, participants look at a set of four images and brainstorm what they have in common to determine a theme. A tech tool for iPads that Regina Chagolla (3rd grade teacher at Rosa Parks) discovered in a Fall CUE session is Puppet Pals. 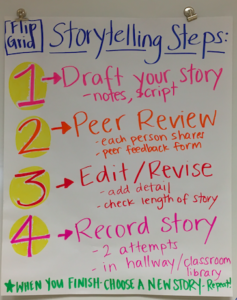 Students can create digital narrative stories with ease. We watched this cute kid-narrated how-to video to learn about Puppet Pals. 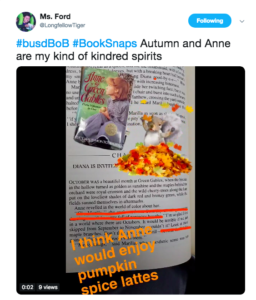 Melanie Ford (Teacher Librarian at Longfellow Middle) shared several highlights including learning about BookSnaps (a way of annotating a reading using pictures to express thinking) from the BookSnaps creator herself, Tara Martin. Melanie shared the link to Tara Martin’s how-to videos to see how “booksnaps” can be created with a variety of tools available at school including Google Slides, Google Drawings, Seesaw, and Book Creator. As part of our 1:1 Chromebook initiative, teachers who are new to Berkeley are completing online technology training. 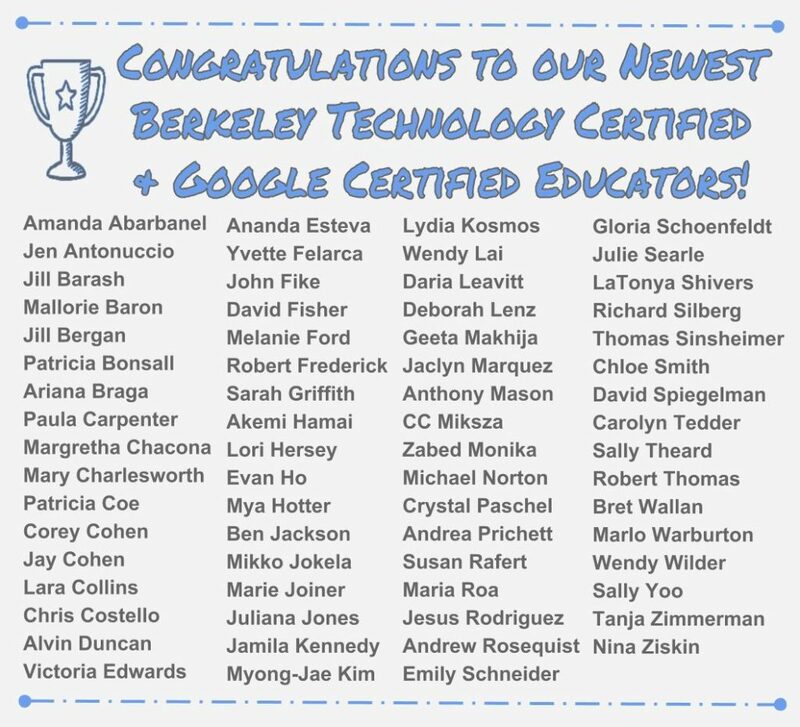 On Monday after school, four teachers attended Berkeley’s first ever Google Certification Party. Gathered together in good company with snacks, two teachers finished studying (then took the exam later in the week) while two other teachers took the test. Congrats to our newest Google Certified Educators: Beth Berlin-Stephens (Teacher Librarian at Willard), Megan Schmidt (6th grade humanities teacher at King), Zack White (7th & 8th grade math teacher at Willard), and Andrea Zavala (8th grade math teacher at Willard)! 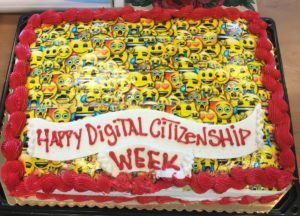 On Tuesday, Tech Teacher Leaders celebrated Digital Citizenship Week with cake and a conversation ignited by Common Sense Education’s webpage How Tech is Changing Childhood which is filled with interesting statistics. 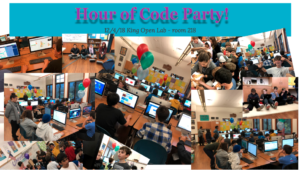 Amy Talley (7th & 8th grade computer science, film, and STEAM teacher) hosted a Made with Code girls coding party after school on Thursday at King. 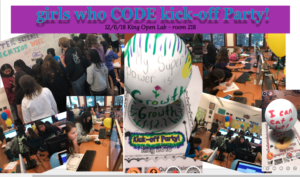 Young women from Cal Berkeley and the YWCA facilitated a fun coding activity and all the middle school girls in attendance had a blast creating a GIF. Reach out to your TTL or a member of DigiTech if any of these ideas inspire you and you want to learn more. Click here for our DigiTech Directory. Berkeley teachers and students are catching what is called #FlipgridFever on social media. In other words, Flipgrid usage in Berkeley schools is spreading! Flipgrid, a video discussion platform, is a fast and easy way for students to capture their ideas in short videos. Tech Teacher Leaders (pictured here), teachers new to BUSD, & King faculty have recorded Flipgrid introductions. Here’s how it works. The teacher logs into Flipgrid, sets up a grid for the berkeley.net and the students.berkeley.net domain. Then the teacher adds a prompt and gives students the code to access it. Students log in with their email accounts and record their responses on the Chromebooks using the built-in webcam and microphone. Afterwards, students review their video, re-record, and post it when ready. Before the video is published on the website, students take a photo that they decorate with stickers. This picture is displayed as the video preview. 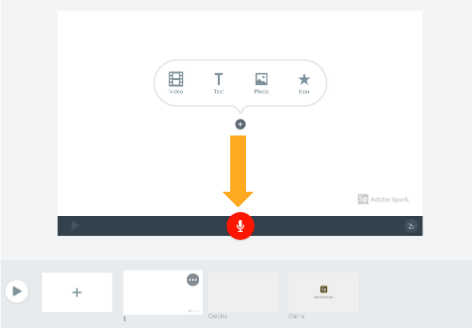 Once that’s done, students can watch each other’s videos. And just like that students are engaged in the video creation process. 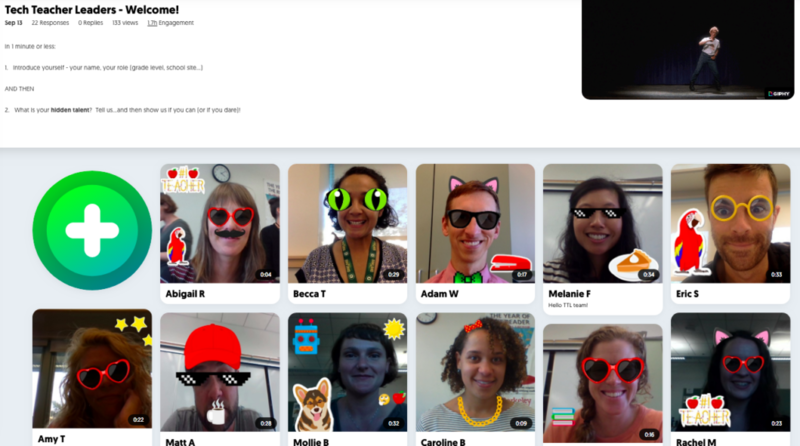 Since June when Flipgrid became entirely free for teachers and students to use, this tech tool has gained in popularity. 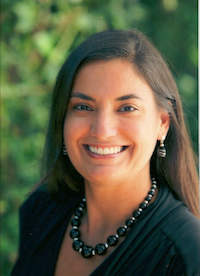 Cristine Tennant, 6th grade Humanities Teacher at King Middle School, launched Flipgrid in her classroom earlier this school year. 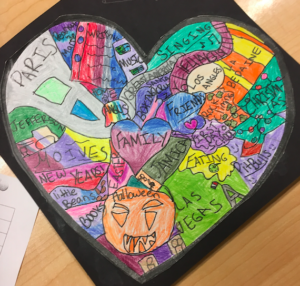 After students filled and colored a heart outline with all the things close to their heart, students picked one of the topics and recorded a story about it. While preparing, the class discussed elements of effective storytelling. Later they took turns spreading out and recording in the hallway. Over the course of a couple of days, students captured a bunch of funny and heartwarming stories. Check out Rauha’s video where she explains why cooking and baking is so important to her. Listen to Mateo’s story about competing in a breakdance competition. Notice how this exercise in speaking and listening also fosters community and connection. Since then, Cristine’s students used Flipgrid again to analyze the inner strengths and weaknesses of a character they are studying. And other teachers will be incorporating this tool soon. For instance, students in Victoria Edwards’ 8th grade English classes at King will record their Inquiry By Design “Author Study” project. Rebecca Goodin, 5th grade teacher at Sylvia Mendez, has a Flipgrid ready for students to document their book recommendations to share with peers. There are limitless possibilities for using Flipgrid to spark and capture student thinking. Interested in learning more about Flipgrid? Check out this The Educator’s Guide to Flipgrid Version 3.0 or reach out to DigiTech. As more and more communication moves into the digital realm, keyboarding has become an essential skill. In order to write fluently using a keyboard, students need practice typing. In the Berkeley Unified School District, students are introduced to typing practice beginning in 3rd grade. In the last school year, over 2000 students completed a combined 267,000 lessons. That is a lot of practice! 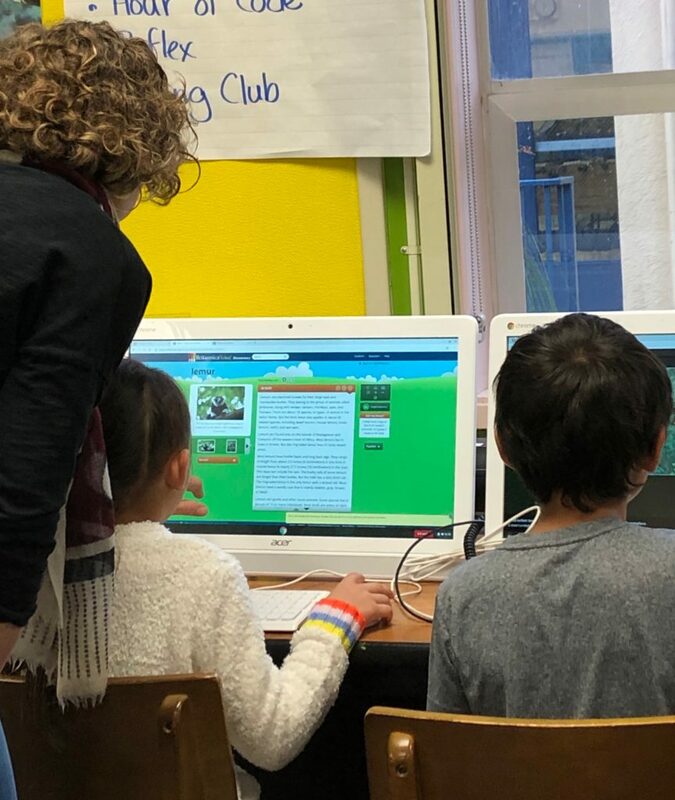 The primary tool we use is Typing Club, a system which incorporates both instructional lessons and games to help students improve their accuracy and skill. Some class time is carved out for typing practice, and kids also have access to the program from home and can practice on their own time. 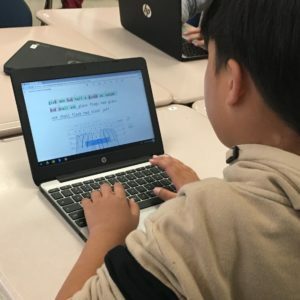 Students are practicing at every elementary and middle school with over 1300 students already signed on and typing in this first month of the school year. 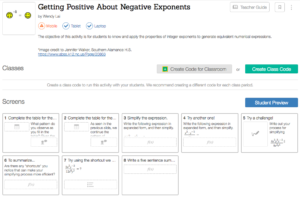 The tool is made more effective with the support of the teachers and staff who ensure that students are using all of their fingers and positioned correctly. At the start of the school year, 3rd graders type an average of 10 words per minute. By 6th grade, kids are typing about 25 words per minute. Fluency on the keyboard allows for an easier flow of thoughts to written words. I can’t wait to see the writing that these young scholars produce! Congrats to our 2018 Class of Technology Certified Educators! Congratulations to the 67 classroom teachers, instructional assistants, and guidance counselors who dedicated time during summer break to study educational technology. 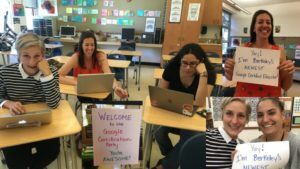 Twenthy-three BUSD employees became “Google Certified Educators” by learning about Google Suite’s apps for education. They reviewed self-paced units of study online and passed a standardized exam. The others chose from a list of tech tools used in Berkeley schools and created a bunch of resources to use in their classrooms to become “Berkeley Technology Certified Educators.” While many completed this training independently, groups met in-person in June after school ended and in August before the school year began. This professional development effort is in support of Berkeley’s 1:1 initiative (one Chromebook per student). 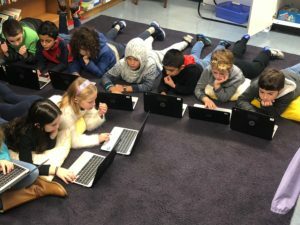 Now Berkeley public schools are 1:1 in grades 4 – 8 and 2:1 in grade 3 (two classes share a cart of Chromebooks). Check out the DigiTech website to learn more about any of these tools. We are excited and impressed at the ways teachers use technology with students. Be sure to subscribe to the blog and share it to others for more stories about tech integration throughout the year. BUSD was recognized this year by Common Sense Media, a national nonprofit, for the district’s implementation of a digital citizenship curriculum designed to help students navigate the digital world safely, responsibly and ethically. A 5th grader creates a YouTube channel. The student shares her videos with classmates, asking for subscribers. Other students start leaving hurtful, mocking comments on the videos and the teasing continues at school during recess. A parent comes up to their child’s classroom teacher on the yard and asks for guidance in using video games after school. Their child is playing for hours each night alone in the bedroom. Should they set limits? If so, how? A student is using BUSD online resources to gather research for a biography on Gandhi. The student finds a particularly interesting paragraph, and copies/pastes it into their Google Doc. The student searches Google for images of Gandhi, and pastes one into the document for cover art. The student does not include any citations. Technology is a powerful tool for teaching and learning, but we have a responsibility to address these challenges, to teach students how to use technology in a thoughtful way. Our digital landscape is changing fast, and parents, teachers, and students need support. 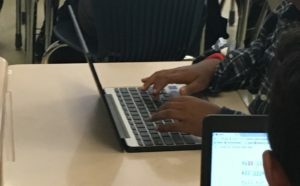 As the Berkeley district continues to expand its 1:1 Chromebook initiative, training for teachers in technology integration and teaching digital citizenship are important components of that work. Students in our 11 elementary and 3 middle schools participate in a rich digital citizenship curriculum designed to help students navigate the digital world safely, responsibly and ethically. 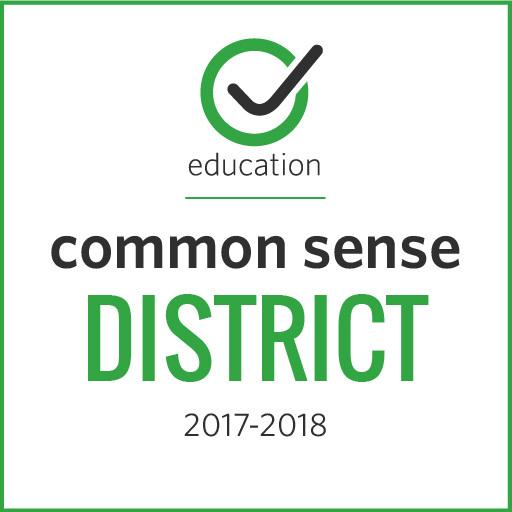 Throughout the year, our Digitech team, school librarians and classroom teachers led lessons based on Common Sense Media’s Digital Citizenship curriculum. Common Sense Media is a national nonprofit that focuses on media literacy, and offers guidance to families and educators as they navigate the online world. The curriculum addresses topics such as public and private information, copyright and creative credit, talking safely online, evaluating online sources, gender stereotypes online, cyberbullying, and much more. 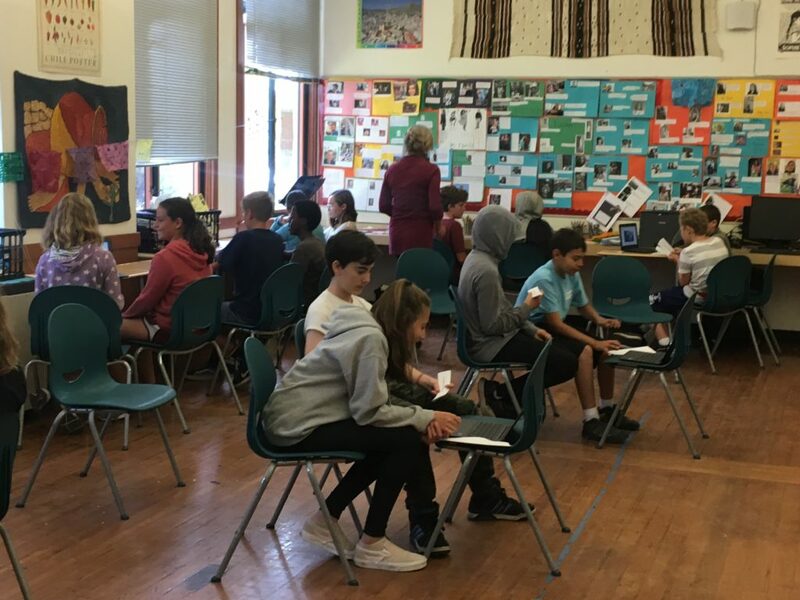 Our classroom discussions, for example, ask students to examine what it means to be a good citizen in their varied communities—what does it mean to be a citizen of Berkeley, for example? Or what does it mean to be a citizen in their family? How do our students follow the rules and norms of those communities? And, by extension, how can they can carry these expectations of good citizenship into their online community? We encourage students to think critically about the information they share online and to think about the difference between private information and public information. We help students develop information literacy skills: how to locate, access and evaluate information they find online. Students hone their online search skills and then developed strategies to evaluate the information they found. We prompt them to ask: who created this website and for what purpose? Is this website trying to sell you something? Is it reputable? Can the information be verified elsewhere? We also teach students to think deeply about ownership and creative credit online. We identify plagiarism and we learn the proper way cite people’s words and ideas from the Internet. We are proud to announce that we met our goal for the 2017-18 school year. 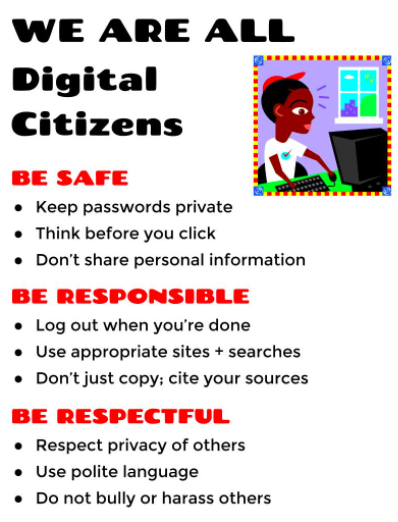 The majority of students in grades 3-8 participated in discussions and activities to build their digital citizenship skills. We learned a tremendous amount last year, and are working closely with educators throughout the district to grow these lessons and to map out how technology use and digital citizenship education can integrate into the academic curriculum. As a community, let’s strive to make sure our media use is intentional, thoughtful and active. The digital citizenship conversations we promoted this past year will continue to grow and benefit us all.